گلی, مهدی, موسوی الکاظمی, حسین. (1397). نقش هموارسازی اثرات توپوگرافی – ایزوستازی بر آنومالی جاذبی. مجله ژئوفیزیک ایران, 12(1), 141-153. مهدی گلی; حسین موسوی الکاظمی. "نقش هموارسازی اثرات توپوگرافی – ایزوستازی بر آنومالی جاذبی". 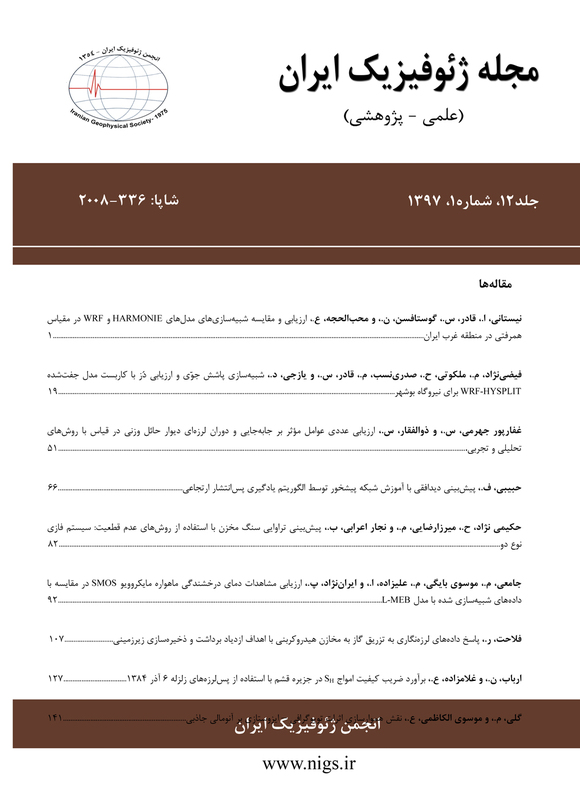 مجله ژئوفیزیک ایران, 12, 1, 1397, 141-153. گلی, مهدی, موسوی الکاظمی, حسین. (1397). 'نقش هموارسازی اثرات توپوگرافی – ایزوستازی بر آنومالی جاذبی', مجله ژئوفیزیک ایران, 12(1), pp. 141-153. گلی, مهدی, موسوی الکاظمی, حسین. نقش هموارسازی اثرات توپوگرافی – ایزوستازی بر آنومالی جاذبی. مجله ژئوفیزیک ایران, 1397; 12(1): 141-153. اثر جاذبی توپوگرافی یک مؤلفه عمده در تغییرات شتاب ثقل است که نقش عمده‌ای در مطالعه میدان ثقل زمین در ژئودزی و ژئوفیزیک دارد. حذف این اثر یک گام مهم در مدل‌سازی محلی میدان ثقل زمین و اکتشافات ژئوفیزیکی است. با حذف اثر توپوگرافی و نرم شدن سیگنال آنومالی جاذبه امکان تقریب با دقت بهتر این سیگنال فراهم می‌شود. این مطالعه به نقش اثرات توپوگرافی و ایزوستازی در نرم کردن سیگنال آنومالی جاذبی می‌پردازد. در این راستا مدل‌های مختلف آنومالی جاذبی نظیر هوای آزاد، بوگه، مدل‌های ایزوستازی پرات، ایری و وینینگ میننر- موریتز (VMM) مورد بررسی و مقایسه قرار می‌گیرد. از آنجا که توپوگرافی بخش عمده تغییرات طول‌موج‌های کوتاه میدان جاذبی را در بر می‌گیرد، انتظار می‌رود آنومالی‌های بوگه نسبت به آنومالی هوای آزاد نرم‌تر باشند. برای بررسی نقش اضافه شدن اثر جبران ایزوستازی، آنومالی‌های دو مدل ایده‌آل پرات و ایری به همراه مدل موهو تعیین‌شده از مدل وینینگ میننر- موریتز با بوگه مقایسه می‌شود. تحلیل عددی روی داده‌های گرانی زمینی منطقه کوهستانی کلرادو در کشور امریکا انجام گرفت. تحلیل طیفی دو بعدی کمترین مربعات برای بررسی نرمی سیگنال‌های هوای آزاد، بوگه و پرات، ایری و VMM به‌کار برده شد. نتایج نشان می‌دهد مدل‌های ایزوستازی نقشی در حذف فرکانس‌های بالای میدان نسبت به مدل بوگه ندارند. بر این اساس هموارسازی مدل‌های ایزوستازی شامل طول‌موج‌های بزرگ‌تر از 50 کیلومتر است. مدل ایزوستازی VMM نرم‌ترین سیگنال را نسبت به سایر بی‌هنجاری‌های دیگر ایجاد می‌کند. The gravity field effects of topography-isostasic masses are one of the most source variations in gravity observations. The removal of the gravitational effect of topography on gravity anomaly is the important task in geodesy and geophysics. In geodesy, the topographical effect is used to make a harmonic gravity space in solving the GBVP. In geophysics, the topographic effect is applied to better detection of anomalous subsurface densities. In addition, in the removing of the topographic effect, the reduced signal is so smooth that it provides the perdition or approximation with higher accuracy. The removal effect of topography mass will produce a large effect on potential and gravity so called indirect effect. This implies that the effect of topography is compensated by an isostasy mechanism. Therefore, far two well-known ideal models, i.e., Pratt and Airy, were frequently used in local and regional gravity field modeling. Naturally, the effect of isostatic mass is related to the medium wavelength corresponded to the regional scale such as 100 km. The present study aimed to evaluate the various topographic/isostatic models success in smoothing gravity anomaly signal. In addition, the Veining Meinesz-Moritz (VMM) model and Bouguer anomalies are compared with Pratt and Airy. It is tried to find an answer for the three following questions: 1- Are the isostatic anomalies smoother than Bouguer ones? 2- What is the wavelength of the gravitational effect of isostatic masses? 3- Does the VMM isostatic model succeed in smoothing gravity anomalies with respect to ideal models of Pratt and Airy? To answer these questions, the numerical assessment was done on about 27000 points observed gravity in Colorado, USA. The topographic and isostatic effects are evaluated by the numerical integration using the 90 meters SRTM DEM. The VMM isostatic effect is computed with respect to Moho, computed by gravity inversion using Sjoberg’s method. The global gravity model, EGM08 and the harmonic topography model, DTM2006 are used to the computation of the Moho depth in the test area. گلی، م.، و نجفی علمداری، م.، 2014، تقریب بیضویِ اثرات توپوگرافی در مدل‌سازی میدان گرانی زمین: فیزیک زمین و فضا، 40، 113-124. گلی، م.، نجفی علمداری، م.، و ونیچک، پ.، 2012، انتقال رو به پایین بی‌هنجاری‌‌های گرانی هلمرت برای تعیین دقیق ژئویید در ایران: فیزیک زمین و فضا، 38، 99-109. نیکخو، م.، 1387، تعیین دقیق ژئویید با استفاده از مدل جهانی جاذبه و تلفیق آن با انواع دتاهای مستقل موجود: دانشکده مهندسی ژئودزی و ژئومتیک، دانشگاه صنعتی خواجه‌نصیرالدین طوسی، تهران، ایران. Abd-Elmotaal, H., 1992, Gravity anomalies based on the Vening Meinesz isostatic model and their statistical behaviour. Bagherbandi, M., 2012, MohoIso, A MATLAB program to determine crustal thickness by an isostatic and a global gravitational model: Computers and Geosciences, 44, 177-183. Devaraju, B., 2015, Understanding filtering on the sphere: experiences from filtering GRACE data: Institute of Geodesy (GIS) University of Stuttgart. Epuh, E. E., Olaleye, J. B., and Omogunloye, O. G., 2016, Gongola Basin Geoid Determination using Isostatic Models and Seismic Reflection Data and Geophysical Interpretation: Geofizicheskiy Zhurnal, 38, 137-151. Eshagh, M., and Bagherbandi, M., 2011, Smoothing impact of isostatic crustal thickness models on local integral inversion of satellite gravity gradiometry data: Acta Geophysica, 59, 891-906. Göttl, F., and Rummel, R., 2009, A Geodetic View on Isostatic Models: Pure and Applied Geophysics, 166, 1247-1260. Heck, B., and Seitz, K., 2007, A comparison of the tesseroid, prism and point-mass approaches for mass reductions in gravity field modelling: Journal of Geodesy. Heiskanen, W. H., and Moritz, H., 1967, Physical Geodesy, W. H., Freeman and Co., San Francisco. Hinze, W. J., 2003, Bouguer reduction density, why 2.67? : Geophysics, 68, 1559-1560. Jekeli, C., 1981, Alternative Methods to Smooth the Earth's Gravity Field Ohio State University, Columbus, OH, United States. Laprise, R., 1992, The resolution of global spectral models: Bulletin of the American Meteorological Society, 73, 1453-1454. Makhloof, A., Ilk, and K. H., 2008, Effects of topographic–isostatic masses on gravitational functionals at the Earth’s surface andat airborne and satellite altitudes: Journal of Geodesy, 82, 93-111. Martinec, Z., 1996, Stability investigations of a discrete downward continuation problem for geoid determination in the Canadian Rocky Mountains: Journal of Geodesy, 70, 805-828. Moritz, H., 1990,The inverse Vening Meinesz problem in isostasy: Geophysical Journal International, 102, 733-738. Rexer, M., and Hirt, C., 2015. Spectral analysis of the Earth’s topographic potential via 2D-DFT: a new data-based degree variance model to degree 90,000: Journal of Geodesy, 89, 887-909. Rummel, R., Rapp, R. H., Sünkel, H., and Tscherning, C. C., 1988, Comparisons of global topographic/isostatic models to the Earth’s observed gravity field: Ohio state University, Columbus. Sansò, F., Sideris, and M. G., 2017, The Downward Continuation Approach: A Long-Lasting Misunderstanding in Physical Geodesy, in: Sansò, F., Sideris, M.G. (Eds. ), Geodetic Boundary Value Problem: the Equivalence between Molodensky’s and Helmert’s Solutions. Springer International Publishing, Cham, 39-46. Schwarz, K. P., Sideris, M. G., and Forsberg, R., 1990, The use of FFT techniques in physical geodesy: Geophysical Journal International, 100, 485-514. Sjöberg, L., 2009, Solving Vening Meinesz-Moritz inverse problem in isostasy: Geophysical Journal International, 179, 1527-1536. Torge, W., and Müller, J., 2012, Geodesy. Watts, A. B., 2001, Isostasy and Flexure of the Lithosphere: Cambridge University Press.